In 2017, the implementation of Zero-Based Budgeting brought a new management challenge: optimize costs while continuing to invest in employees’ training and qualification. Due to the methodology, we were able to reduce costs compared to the number in the last year without reducing the time invested in the training of professionals. 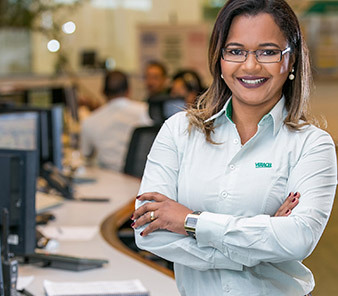 *All 3,334 employees are in the region of Bahia. When we need to fill a vacancy, our first option is choosing from employees who already work at Veracel through internal selection processes. When this is not possible, we prefer to hire professionals from the region, valuing local workforce. In this case, the disclose job vacancies on our channels, such our site, and regional media and via local institutions as well, such as the National Employment System (Sine, in Portuguese acronym). In addition to investments in own team – and aware of its responsibility to the local community –,Veracel has continuous practices to broaden the opportunities to hire professionals from the region. For this, the company seeks to provide the applicants with training and qualification. The 24th class of this initiative had 23 students selected from 550 applicants in 2017. In all, there were 180 hours of training in the company’s Itinerant Training module in the municipality of Itabela (BA). At the end of two months, 14 students who excelled were hired by Veracel as trainee operators. 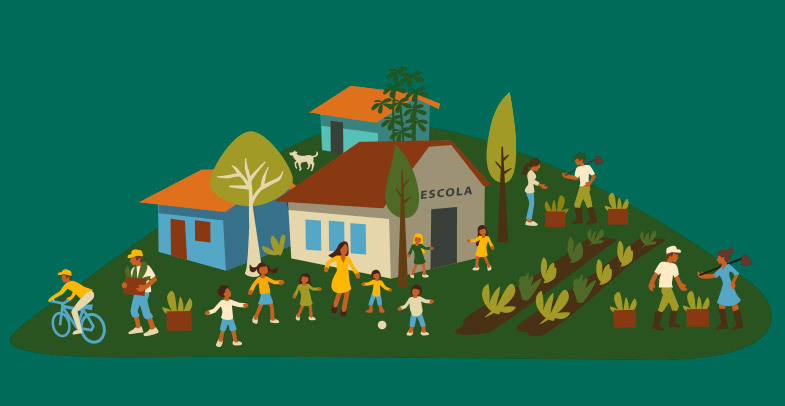 The classes are taught by a team formed by Veracel’s skilled employees who were trained by Senai. Learn more about Course for Forestry Machinery operators . In November, 18 students of the course of Administrative Tasks attended the closing ceremony of the Young Apprentice 2017. The group received theoretical and practical training during 15 months, not only on administrative practices, but also about other important topics for the professional, such as sustainability, forest process certification, environment, among others. Once hired, our employees rely on a series of programs and incentives designed to improve performance and motivate professional development. Result-based Management (GPR, in Portuguese acronym) evaluates and rewards the management-level employee’s performance by aligning their individual goals with the company’s strategic objectives. Other employees count on Profit Participation (PR, in Portuguese acronym) paid annually when the goals agreed among the company and the employees are reached, with monitoring of trade unions. 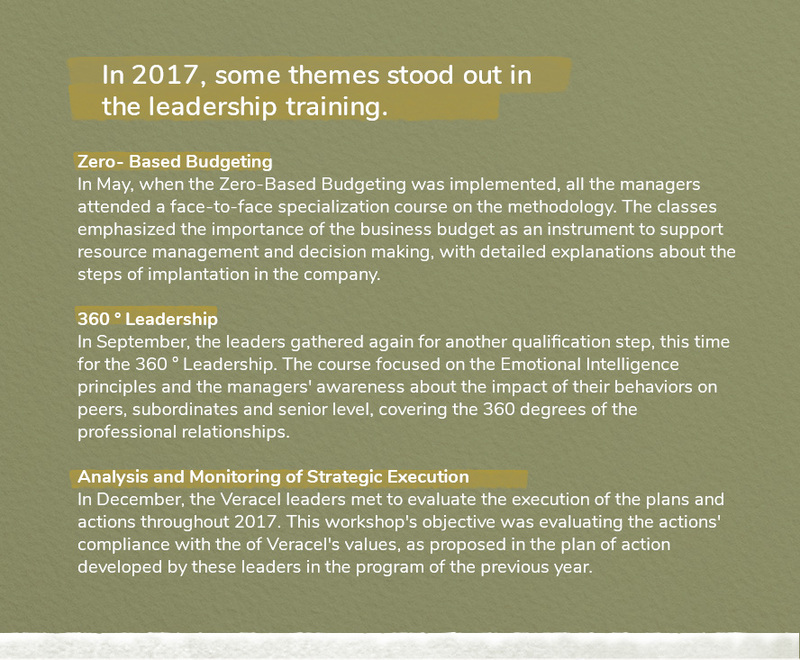 In 2017, Veracel initiated the training of the first Green Belts class trained internally. There were 24 attendees among managers, engineers, technical assistants and maintenance and process engineers. In November and December, 80 hours of lectures were given, followed by the practical part of the course, comprising about five months for project development and implementation. The leadership’s role in leading teams and developing a suitable work environment is undisputed. That’s why we invest constantly in training of managers in order to improve not only their technical skills, but also their people management abilities. In 2017, about 70 managers attended the Veracel Leadership DNA Development to leverage aspects such as systemic vision, strategic and economic-financial management and performance management, among others. In 2017, the Maturity Evaluation process, also called SAM® System,, was extended to include the IT Coordination, Audit and Compliance Management and Recovery and Utility Coordination, a total of five areas evaluated since the project implementation in 2016. The prospect is that the SAM® Systems will be gradually implemented in other department over the next few years. * Evaluated by the GPR tool (Result-Based Management) based on Veracel corporate, individual and competence goals (focus and result- orientation, leadership, interpersonal relationships, teamwork, people development and self-development).